Clear film covering a die cut opening. A space created by forming a substrate into a shape to provide protection in a package. A secondary layer of material joined over an existing substrate that creates a multi-level finish. To set up and finish into a fully completed format. A process used in paper making to whiten paper. Also a reference as to the whiteness of the paper. Raised area of the sheet created using an engraved tool and a die press. Generic term referring to the substrate. Triggers at the ends of the ring metal that assist the opening of the ring. The thickness of material measured in thousandths of an inch called points. A pocket formed with a double score along each side to create a spine that gives the pocket a greater thickness and capacity than a flat pocket. Paper with a high-gloss coating that can rival the gloss of a photograph. Recessed area of a package used to house an item: CD, VHS, promotional item, etc. A paperboard substrate, normally recycled and used primarily in consumer packaging. Print form that combines more than one item for print and finishing. The party that is receiving goods. A score or impression in a substrate that facilitates folding and bending. An area on a sheet that has a depression created using an engraved tool and die press. Feathered edge of a specialty paper. The process of cutting a material into its finished shape using a steel rule cutting die and a die press. The registration of an embossed area to a printed area. Expanded Poly Styrene; styrene foam blocks are hotwire-cut to create inserts used to support the structure of a dimensional package. Flat pocket that can become a capacity pocket using a Z-fold design technique. Freight On Board; the payment point on a freight shipment. “F.O.B. Destination” indicates the shipper is paying the transportation costs through to the final destination. “F.O.B. Shipping Point” means freight costs are not being paid by the shipper. “F.O.B.” can be followed by a zip code, which is the point to which the shipper is paying the freight. A layer of polypropylene or polyester that is applied to a printed sheet. It is available in gloss, matte, satin or a metallic finish. The process of converting a sheet into its final form. Material extending off the ends of various panels on a package. The flat application and transfer of foil to a substrate using heat and pressure. This graphic technique can be used in conjunction with debossing or embossing. Collating, inserting and loading materials into a package for bulk shipping or mailing. The fiber direction in a sheet of paper. Flat panel with a center score that expands to a given width. Gussets can be pushed in or out in manufacturing and should be specified at the time of order. A score or crease that is used to open and close a panel. Extremely durable and reliable adhesive used in the construction of a package. A technique for cutting and shaping EPS foam. Materials used to position, support and protect an object inside its package. Paper color; natural kraft has a characteristic light brown appearance. 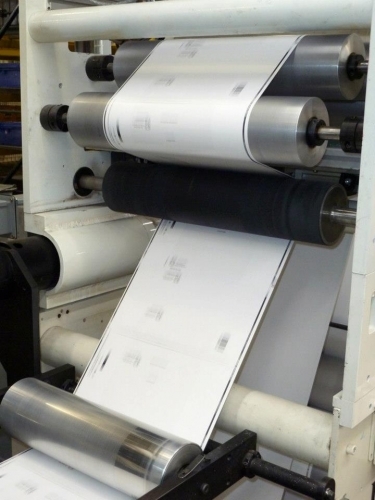 The application of litho label to a corrugate sheet using a cold adhesive and pressure. A machine that applies film lamination to paperboard. Usually an 80# or 100# C1S stock that is printed and applied with adhesive to an E-flute corrugated sheet. Film lamination is required to prevent cracking on folding scores. Tabs used in packaging for closure. They may be passive for re-opening a package, or positive for mailing or for more permanent applications. The ability to automatically glue, die cut or finish a package. Wooden deck-like structure for loading boxes onto, for storage or shipping. The face or side of a package. Solid fiber board used for making packaging. A U.S. Postal Service term; certification that allows manufacturing companies to mail packages or flats directly from their facilities into a USPS vehicle, bypassing the local post office. An impression or crease in a substrate that is used for folding or bending. To insert a material between two packages to prevent abrasion and scratching in shipping. Unprinted newsprint is often used. A cut made in a substrate without removing any material. A cut made in a substrate that does remove material. The core material (i.e. paperboard) used in a printing, finishing or packaging process. A panel or page of a package that is printed on one side, but folded onto itself, presenting graphics on both sides. Tabs that extend off a panel and are tucked into a mated slit; often used to close a package. Litho-label wrapped over a fiber or chipboard edge, for instance on a slipcase, to provide a more finished appearance. An area cut out of a panel; can be covered in cello. Popular software program used in the manipulation of electronic files and images, toward the creation of the final artwork. Clear liquid topcoat applied to a printed sheet. Printing that extends beyond the edit of a panel or page. Photosensitive paper that images in varying degrees of the color blue. This proof is used to check copy and position. The meeting of two or more colors where there is no overlap or trap. The result is often a visible thin white line. Fatty/Skinny to slightly decrease (choke) or increase (spread) the size of a graphic element to create a trap or fit. 3M trade name for an overlay color proof. The separation of a continuous tone image into the four process colors: cyan, magenta, yellow and black. Also final film or plate-ready film; a single piece of film that contains all of the characteristics of several pieces of working films. DuPont trade name for a color contract proof, used as a color guide on press. The finished outline of a package or shape. A list of the files, fonts and software programs used to create an electronic file. Also Computer to Plate (CTP); the process of transferring electronic files directly to print plates, eliminating the intermediate step of imaging films. Dots Per Inch; used loosely to describe the resolution of an element. Refers to the overlapping of inks done in two press passes while one of the inks is dry and one is wet. The graphic representation of an image using only two colors. DuPont trade name for a blueline proof showing type and position of images. Encapsulated Post Script; a commonly used format for moving files from one software application to another electronically. The elements are locked to prevent inadvertent changes. An electronic drawing of the actual die layout. It is used to prepare and layout artwork in its proper orientation. It is also used to create the die tool and should not be altered without notice. The representation of all colors through an arrangement of dots of the four processed printing ink colors: cyan, magenta, yellow and black. A one-color photographic image, with tones reproduced by varying-sized dots of ink. An imperfection in a printed sheet caused by a contaminant in the print process. Any paper dust, spray powder or other contaminant will adhere to a blanket or plate on press and prevent ink from being used in that area. The result is a small white spot. Increased density of a color in a small area that can occur in film or plate making. Rules that are placed in a document to mark specific areas to place graphic images. A keyline can also represent the shape of a three-dimensional product while in a flat two-dimensional drawing. The removal of all other colors behind a specific element. With a black background, you would remove the black behind any colored type. Number of rows of dots per inch in a screen tint, halftone or separation. Activities required to set up a manufacturing process or piece of equipment. 3M trade name for a color proof of final films. Undesirable pattern in halftones and screen tints caused by conflicted screen patterns. Total number of pages including blanks and printed pages. Pantone Matching System; a standard for color reproduction. The verification of an electronic document for potential problems prior to outputting film or plates. Test sheet produced to check color, type, layout and design. A machine-made or handmade sample of a pre-production package. Prototype made from a Dylux proof that illustrates the printing, folding and scoring in a three-dimensional form. Document or part of an art file that was created with Quark Xpress. Software program written for the graphic arts industry. A tool for page construction and type manipulation. Proof of a scanned image used to check the color or quality on an image prior to final films/plating. Image showing out of a printed background area. Piece of film with dots of uniform density. The number of rows of dots per inch in a screen for tints or halftones. Area printed with dots where ink coverage is less than 100% to simulate shading. The overlapping of adjacent colors, so as to avoid the potential of a white gap between images. Size of the printed sheet after last trim is made. Under Color Removal; done during scanning to reduce the total amount of ink coverage in shadow areas by replacing some of the cyan, magenta and yellow with black. Reductions of ink usage can improve ink drying and dot gain control while on press. Refers to the overlapping of inks done in one press pass while the inks are all still wet. An area cut out of masking material on a mechanical to position a graphic element. Preliminary or intermediate films, which are then combined to produce the final (composite) film.